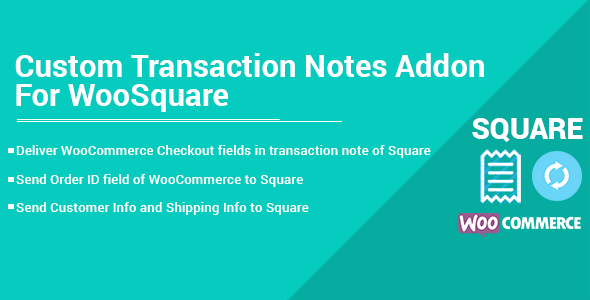 Custom Transaction Note Add-on will show you WooCommerce checkout fields ( billings ) and order ID at Square transaction note which you have choose from addon transaction Note settings while using WooSquare Pro Plugin. This Add-on will give you 60 characters limit to show in transaction note. Download Add-on from codecanyon.net, Before installing add-on you must have WooSquare Pro activated and then install this add-on at your wordpress plugin section, as soon as you activate this add-on you can able to see plugin activated. limit of 60 characters to send in transaction note otherwise all extra characters will Automatically removed.